A friend from the Australias brought me this Chomp bar. I think she said it’s one of her favorites. Indeed, there is something utterly likable about these Chomp bars. They are long and thinnish, and easy to eat. The texture is fantastic. Kinda like a Kit Kat, not as crunchy though, and chewier. Flakier too, and a bit looser, but not crumby… if that makes sense. The caramel makes the Chomp bar texture like Tunnock’s Caramel bar, which is a superb specimen of candy. Yet, there’s something simply forgettable about the Chomp, as well: the flavors. 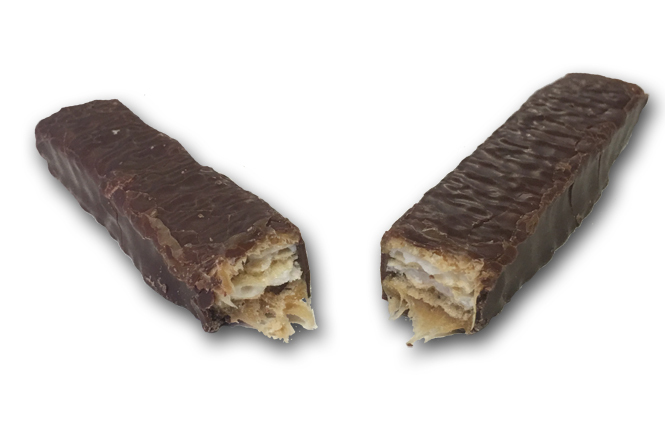 The Chomp has a marshmallow thing going on, which I don’t mind, but I don’t taste the caramel – I only feel it. Plus, the chocolate is below average. Let’s call a spade a spade. Compound chocolate is crap chocolate. Yet, I like this bar. Dead set on some compound chocolate? Do us all a favor and get a Charleston Chew. The Chew is longer, bigger, chewier, with more vanilla marshmallow and quite unique. The Chomp is like the Chew’s 2nd cousin once removed. The Chomp? Sure I’ll eat it when I get it for free. But I’m not dashing out to buy a box of 52. Buy the Uk version. Cheaper. Hard hitting review. Doing the tough work. Keep on keepin’ on. Whoa. Experts have to execute the process, most likely in white lab coats. I have new-found respect for compounded chocolate! I will eschew the Charleston Chew in favor of the Cadbury Chomp next time I’m in the Commonwealth.